Are you loving the cold weather? I’m not, but I always think it is interesting that people either really love it or really hate it. And after two so called “polar vortexes”, most people seem to really dislike the cold this year. 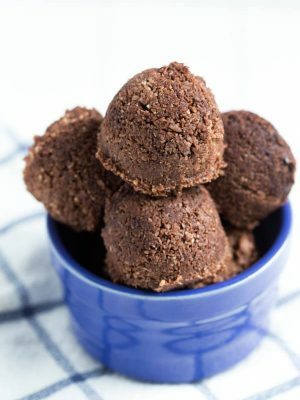 One thing that we can probably all agree on is that food is always comforting when the weather is rough. 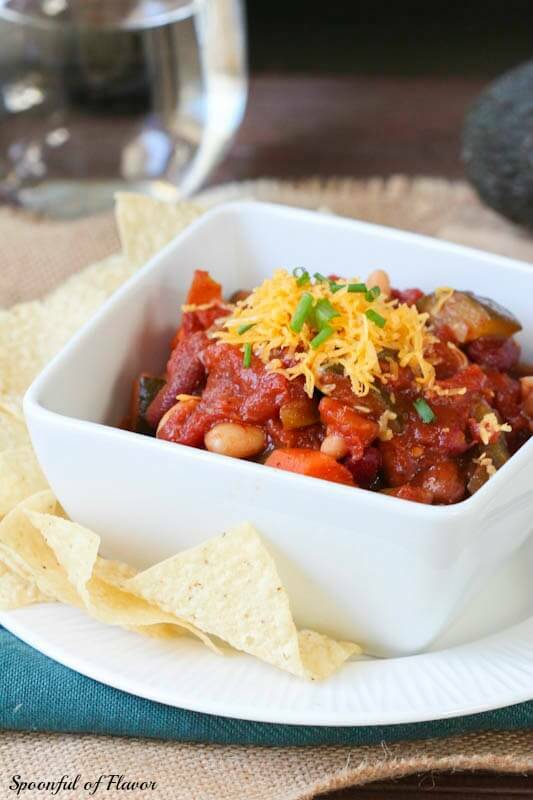 If the temperatures are sweltering, we reach for a scoop of ice cream and when the weather is cold, we snuggle up by the fireplace with a hearty bowl of chili. 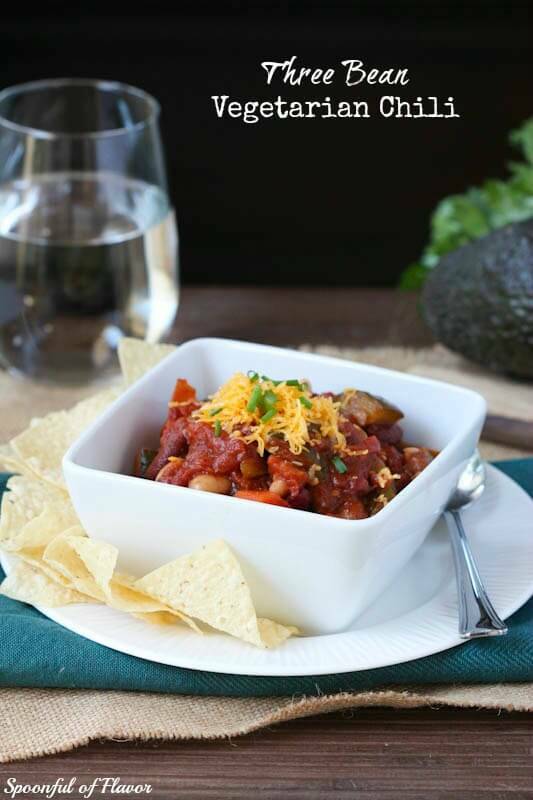 During the winter months, I try to make chili at least once a week, and always add this Three Bean Vegetarian Chili to the rotation. 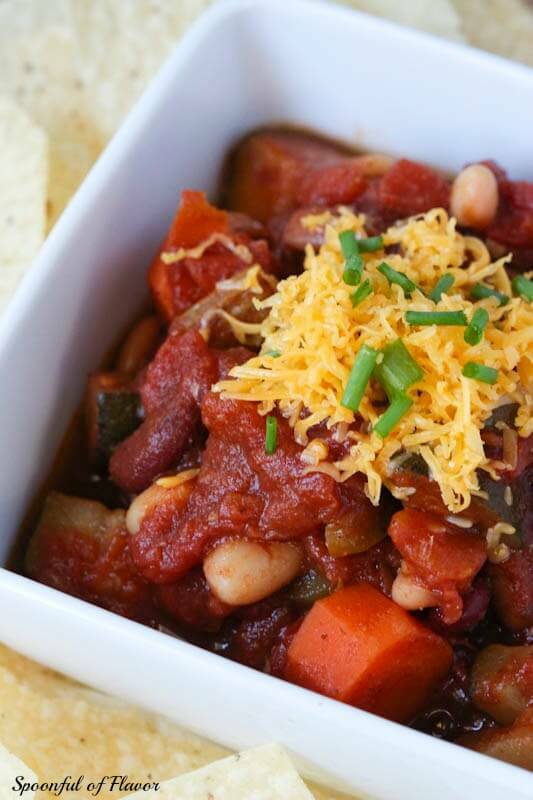 This chili is thick and loaded with vegetables. 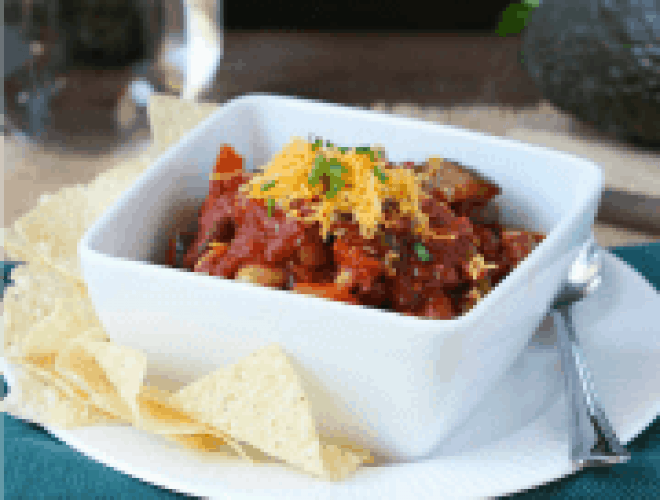 It is slightly seasoned and perfect to enjoy with a side of tortilla chips or layered over the top of a baked sweet potato. 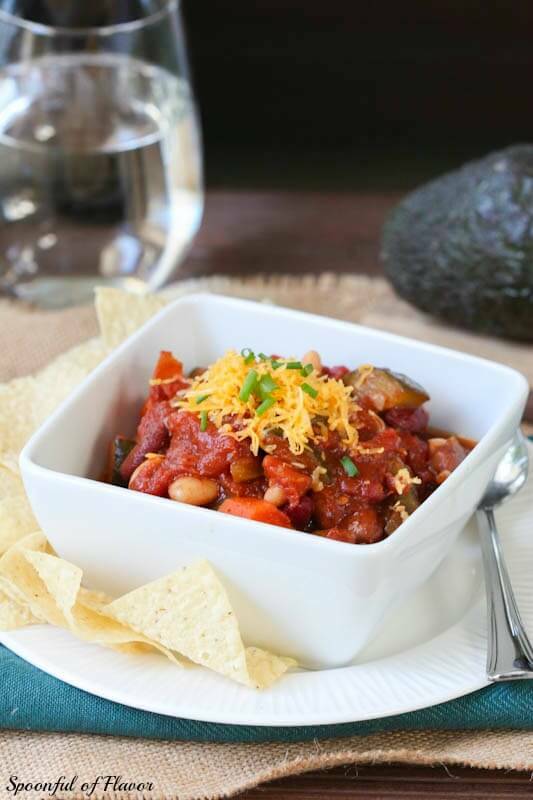 A bowl of vegetarian chili is also a great way to enjoy a hearty serving of vegetables. I’m trying to increase my consumption of vegetables. Especially in the winter, it makes me feel more energized. 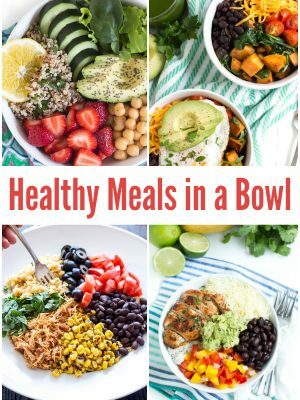 I usually eat quite a bit in the form of salads, side dishes and snacks, but I’m sure that my fruit intake is much higher than my veggies. I could eat two pints of strawberries or a few mangoes in one sitting and I make smoothies all the time. I don’t know why, but I’m lazy about juicing. It is probably because I don’t have a very good juicer. But, I’m trying to add at least one vegetable based juice drink to my diet everyday. I have to admit, this generally means stopping at Whole Foods and picking up one of their organic juice drinks (I’m hooked on the Suja brand). I really love them and it is amazing how many vegetables I can drink in such a short period of time. I start the day with a drink and feel refreshed. 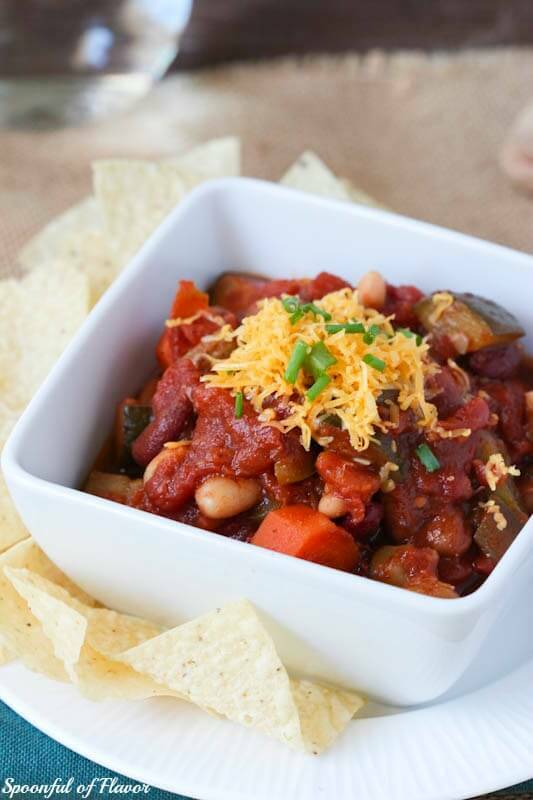 Mix it up with this three bean vegetarian chili that is thick and loaded with vegetables. Add chips and you have a perfect warm meal. Heat the olive oil in a large Dutch oven or saucepan over medium-high heat. Add the onion and cook until tender, about 5 minutes. Sir in the garlic, carrots, celery, pepper and zucchini. Cook until vegetables are tender, about 10 minutes. Add the great northern beans, kidney beans, pinto beans, diced tomatoes and tomato sauce. Season with chili powder, cumin, salt and pepper. Cover, reduce heat to low, and simmer 20 minutes. Uncover and cook for 30 additional minutes. 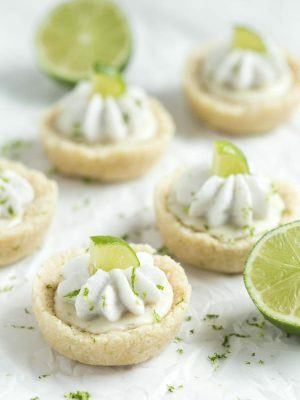 Garnish with cheese, sour cream, and green onions if desired. Store leftovers in a sealed container in the refrigerator for up to 3 days. Reheat prior to serving. Your right - we are eating a lot of ice-cream at the moment. 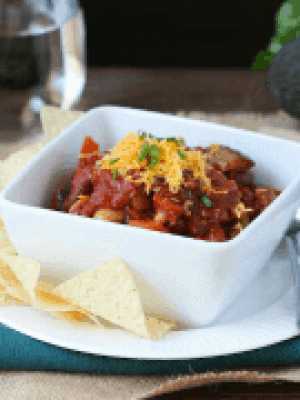 How I crave a good hot chilli - this looks great. Although not sure what type of bean a great northern bean is?